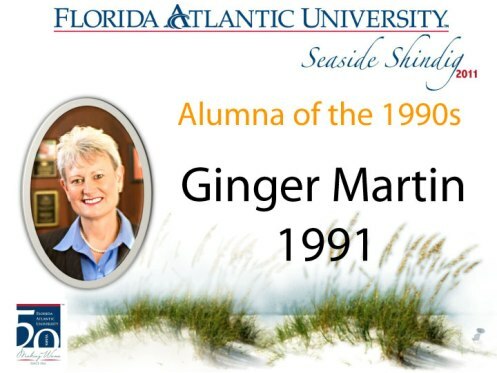 At the sixth annual FAU Seaside Shindig, held on Saturday, April 2nd, Ginger Martin, President and CEO of American National Bank, was recognized as the Alumna for the 1990s and was presented with an award. The goal of this event was to raise scholarship funds for Broward students and provide support for Broward alumni initiatives. This entry was posted on Thursday, April 7th, 2011 at 9:13 am and is filed under Uncategorized. You can follow any responses to this entry through the RSS 2.0 feed. You can leave a response, or trackback from your own site.